PKSF on 26 November 2017 organised a workshop titled “People’s Voice: Strengthening implementation of SDGs-2030 in Bangladesh” with a view to helping strengthen accelerate effective realisation of the UN-sponsored Sustainable Development Goals (SDGs). Civil Aviation and Tourism Minister Mr Rashed Khan Menon, MP, graced the closing ceremony of the workshop held at PKSF Bhaban as the chief guest while Dr Zafar Ahmed Khan, Senior Secretary of the Ministry of Water Resources, and Mr Arijit Chowdhury, Additional Secretary of Financial Institutions Division (FID) under the Ministry of Finance were the special guests. PKSF Chairman Dr Qazi Kholiquzzaman Ahmad chaired the ceremony and Managing Director Mr Md Abdul Karim delivered the welcome address. The Civil Aviation and Tourism Minister highly praised PKSF activities in sustainable poverty alleviation and beyond-poverty development. “All sorts of development have to be human-centred … and people of all levels, including the grassroots, should be included in the process,” Mr Rashed Khan Menon said, adding that PKSF will hopefully continue to play an effective role in helping the country achieve the SDGs within the 2030 deadline. 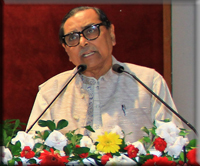 The range of PKSF’s operations is so vast that its activities touch upon all the SDGs in one way or another, commented Additional Secretary Mr Arijit Chowdhury. He expressed his hope that PKSF would further strengthen its activities and help Bangladesh steer towards realising the SDGs. At the beginning of the workshop, two group discussion moots on Goal 1 (No Poverty), Goal 2 (Zero Hunger), and Goal 6 (Clean Water and Sanitation) took place. Executive Director Mr Mohsin Ali of WAVE Foundation and SMA Rashid, Executive Director of NGO Forum for Public Health presented on the key outcomes of the discussions. High officials from govt and non-govt agencies, development thinkers, PKSF staff and representatives of its Partner Organisations attended the daylong workshop.